Food motivated dogs can spend hours playing with treat dispensing toys. The StarMark Bob-A-Lot dog toy can be filled with treats or kibble to provide Fido with long lasting entertainment. You can adjust the difficulty level to allow for easier access to the food in the beginning and make it more challenging once your dog gets the hang of it. You can use most treat dispensing toys as a slow feeder as well. You can place your dog's kibble inside, which means he'll have to work for his meals. 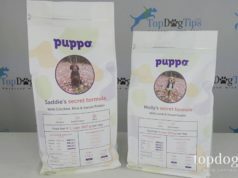 This helps to slow down fast eaters and provide mental stimulation for your pet. These types of dog toys are especially beneficial for puppies and hyperactive dogs. Quite often a dog with excessive energy or behavior challenges is simply bored from lack of mental stimulation. A bored dog will try to occupy and entertain himself, which usually leads to unacceptable behavior, like chewing. Providing mentally stimulating dog toys and adequate exercise may be all you need to do to calm a hyper pooch or curb behavior trouble. The StarMark Bob-A-Lot dog toy can provide many hours of dog-friendly fun for pups that are food motivated. It's suitable for all breeds and sizes, and would be ideal for multi-dog homes. The StarMark Bob-A-Lot dog toy comes in two sizes. I show the small size in this review. The smaller size holds about 1 cup of food and the larger size holds up to 3 cups of food. The smaller StarMark Bob-A-Lot is about 6.4″ tall and has one opening. The larger size is about 8.9″ tall and has two openings for treats or kibble to fall out. This is one of the few interactive dog toys on the market that is large enough to fit an entire meal for a large breed. 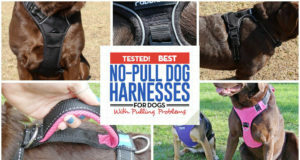 The design is simple, and it works well for small and large dogs. The weighted bottom wobbles back and forth as your dog pushes the toy around with his nose and/or paws. As it bobs around, kibble or treats occasionally fall from the hole on the side. As I demonstrate in my video review above, the hole has a sliding, adjustable cover that allows you to make it more or less challenging. The smaller the size of the opening, the harder it will be for your dog to get a kibble to fall out. I like the anti-slip rubber bottom featured on the StarMark Bob-A-Lot toy. It allows your dog to push it back and forth without the toy rolling all over the room. I've tried other similar products that roll from one side of the room to the other. While this provides more physical exercise, the toy ends up getting stuck under furniture or other places where my dogs can't get to it. The one drawback to this dog toy is that it is difficult to clean. Many similar products come apart in the middle to make washing easier. The StarMark-Bob-A-Lot has a screw top, which you can see in my video review above. When cleaning it, I submerge the toy in warm soapy water and swish it around to clean the inside. You can purchase the smaller StarMark Bob-A-Lot on Amazon for $10 right now, and the larger size is currently selling for $16.99. This price is comparable to other similar interactive, treat dispensing dog toys. It is a good value for the price, in my opinion.